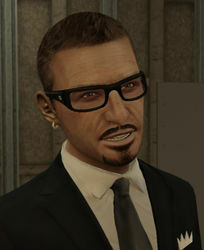 “Gay Tony” is a character referred to in Grand Theft Auto IV, but who a primary character in The Ballad of Gay Tony. He is not the player-character, however, that role belongs to Luis Fernando Lopez who works for Tony. As Tony’s nickname suggests he is openly gay, he is also an on-again-off-again drug addict and the owner of several (failing) nightclubs. The main plot of the game focuses on Luis trying to help Tony get out of debt and appease the various parties trying to kill him. A video with all missions in the game is available here and a trailer for the game appears below. This entry was posted in 2010s, Gay, Gay (explicit), Queer Men on September 14, 2015 by Adrienne Shaw.